It looks like February is becoming the new October in our industry… a month full of conferences. In fact, we’ll be at two of them this year – MRA’s CEO Summit in Napa Valley and the CASRO Digital Conference in Nashville. February also includes Qual 360 and IIeX (both in Europe), the premier of the new Quirk’s Event and more. Too many? Maybe… but by and large, I am a big fan of these kinds of events. In fact, I’ve got seven reasons why you might want to put more of them on your calendar for 2015. #1 – Learning. This is clearly the top reason most people attend conferences… to develop and expand their skill set and knowledge. Remember there are two places to learn… in the sessions and on the exhibit floor. Many of the new things in our industry (technology, tools, etc.) come from vendors – so make sure to plan some of your time to visit the exhibit hall. #2 – Networking. You never know who is going to be at a particular event… potential partners, potential vendors and prospective clients. Be prepared (with a good elevator pitch and lots of business cards) to chat with whomever you come across. In fact, be proactive about it… seek people out. #3 – Exhibiting. The exhibit floor is the only place in business – aside from a retail store – where your potential clients come to you. Done right (and so few companies actually do it right), exhibiting can be one of your most productive marketing & sales tools. For more information on maximizing your exhibiting, download The Exhibitor’s Guidebook at http://bit.ly/exhibit-ebook. #4 – Content fodder. If content marketing is part of your marketing plan, consider conferences as a rich source of information for developing that content. Take ideas from what are people are talking about in the hallways, what the hot presentations are and what’s new in the exhibits… then write about it, provide an opinion about it or provide a contrarian view. #5 – Competitive intel. You competitors will be all around you… some as speakers, some as exhibitors, some just chatting during breaks. Listen and learn. #6 – Social time. All work and no play make Johnnie a dull boy (or something like that). Conferences are also a chance to unwind a little, reconnect with old friends and make some new ones. So enjoy your time away from the office. And if the conference is taking place in a fun/interesting/unique location… why not take your significant other? #7 – Make sales calls. You’ve already bought the plane ticket… so if you happen to have clients or prospects in the city where the conference is taking place, why not stay an extra day or two and schedule some sales calls or client visits? 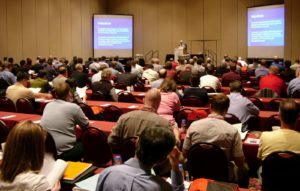 The bottom line is this… attending conferences is a significant investment in time and money. So, if you’re gonna make the investment – and I would argue that you should – make sure you’re getting the most out of it.